Well, this is it: the issue you've been hearing about in all the filler segments of the local news. 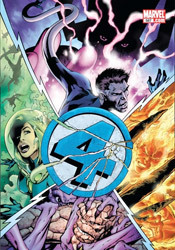 This month the Fantastic Four lose one of their own, and (if we're listening to all the hyperbole spewed by the Marvel promotions department) nothing will ever be the same again. Frankly, I'm surprised the mainstream media still buys into these grandiose claims of heroic death in the comics industry. They've taken the bait for each dirt nap from Superman to Captain America and every single time, without fail, the original character is back below the masthead within a relatively short period of time. This shouldn't come as much of a surprise to the fanboy faithful, what with the recurring joke that only Bucky and Uncle Ben ever actually stay dead (hey... come to think of it, maybe we should think about amending that one) but it constantly amazes me that the programming directors of major networks still haven't caught onto that little nugget of info and quit covering these issues like they're some kind of major, permanent event. At any rate, that is what it is and we've still got a few shovelfuls of dirt to deposit on a nameless character's grave before the day is done. Playing his cards close to the vest, longtime F4 scribe Jonathan Hickman has split the team's membership, dropping them each into a perilous, potentially volatile situation sans backup. Reed is on the surface of a world that's on a collision course with Galactus. Susan stands between the two armies of an impending Atlantean civil war. Ben and Johnny defend the kids (and the Baxter Building) from a surprise negative zone invasion. Somebody's going home in a box, and it probably won't be HERBIE (although that would be the greatest bait-and-switch of all time). Hickman does a nice job of filling the air with an immersive sense of tension, like storm clouds gathering on the horizon. Despite that dark premonition, though, he's sent the team out to very familiar territory: adventuring, exploring and problem-solving in unfamiliar landscapes at the furthest reaches of our understanding. My favorite element of Fantastic Four has always been that sense of exploration, of looking behind the curtain into the unknown, and this month we're doing that in three different places. The feeling is that the team is stretching themselves a bit too thin, over-diversifying their interests to disastrous result. I suppose it was inevitable, considering their unquenchable thirst for the mysterious, that they'd eventually get ahold of something beyond their ability to contain. It's an inevitable comeuppance, I guess. Steve Epting's artwork fits the mold of the classical Marvel style, spectacular but grounded. In many panels he appears to be channeling several of the publisher's founding fathers, with the influence of John Romita Sr. shining through most evidently, while in others his take is much more modern and streamlined. His work is best in the galactic scenery that surrounds Reed, but he handles the foreign landscapes presented by the other scenarios decently enough, as well. This issue in particular demands a lot from its artwork, and while none of his panels are really pin-up material, Epting never loses his audience with a momentary lapse of concentration. His work is strong and disciplined, sometimes at the expense of being overly adventurous. Fantastic Four #587 does deliver on its promise of offing one of the founding members, and while the reasoning for that ultimate sacrifice isn't entirely waterproof, it's no less heroic or meaningful as a result. Jonathan Hickman tells a complicated, multi-faceted story in a clean, easy-to-read style, forking up some big changes without giving in to the urge to over-dictate them. This is a good issue, albeit not an entirely fantastic one, as it never fully reaches the state of heavy emotion it was seemingly intended to. Borrow it.